Perhaps taking inspiration from Disney’s plan to keep releasing Star Wars movies basically until the end of time, Deadline reports that Universal is seeking to extend the shelf life of its massively successful Fast & Furious series with a spinoff film featuring Jason Statham’s tough-talking bad guy Deckard Shaw and Dwayne Johnson’s equally tough-talking good guy Luke Hobbs. The basic idea is that the two—who duked it out in a coffee-table shattering fistfight in Furious 7—will form an “unlikely alliance” that will send them off on a side adventure unrelated to the main Fast & Furious continuity (such as it is). 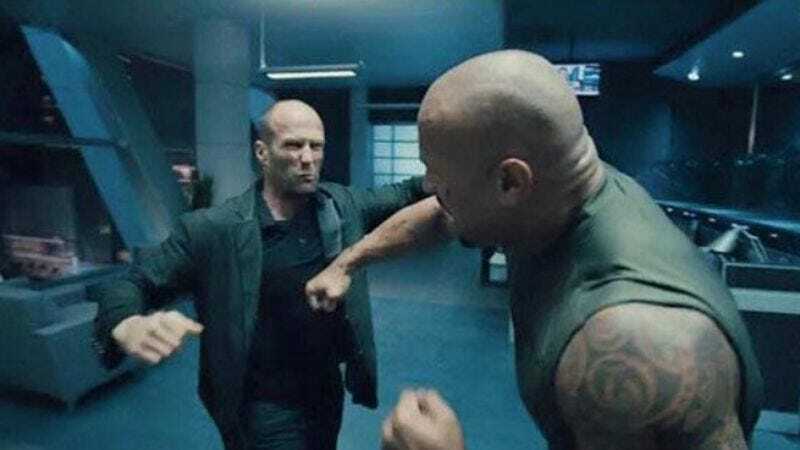 Unlikely partnerships and uneasy alliances are the Fast & Furious series’ bread and butter—or Corona and hot dogs, as the case may be—and with the chemistry between gruff Statham and good-natured Johnson, this could be a winning buddy-movie formula. That’s about all we know for now; series architect Chris Morgan will be handling scripting duties, and is expected to start working furiously on the screenplay soon.